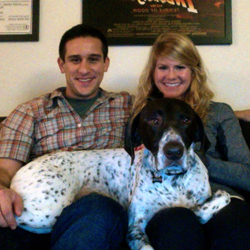 Bennet is making himself right at home with his new mom & dad! Bennet has been looking for his perfect “forever home” for quite some time now, and he has found his special family just in time for the holidays. When his new family met him for the first time it was love at first site, and there was no question that he was the perfect dog for them. He is a very energetic little eight-year old and he can’t wait to go on runs with his forever Dad. His home has a big back yard where he can sniff and explore to his heart’s content. Bennet is excited to also get some good quality cuddle time in with his forever Mom.